I recently realized something huge that made me feel ALL the feels. I’m living the life I dreamed of as a little girl. But not necessarily in terms of my career, where I live, the amount of money I make, etc. You see, when I was a little girl, I would look up at the night sky, find the brightest star out there, and wish as hard as I could for two things – my prince charming (not joking!) and a family of my own to take care of and love. Someone was surely listening to me because both my wishes came true. I found and married my prince charming and best friend, and together we created our beautiful baby boy and started a family of our own. With this realization comes a sense of deep gratitude. I know I’m lucky and very fortunate. Life’s not perfect, but it sure is good. And I’m constantly saying/feeling/thinking “thank you” for it all. With this realization also comes a desire to freeze time. I often look at Kaiden and feel both overwhelmed by love and joy and also a hint of sadness and anxiety (have you turned on the news lately?!). 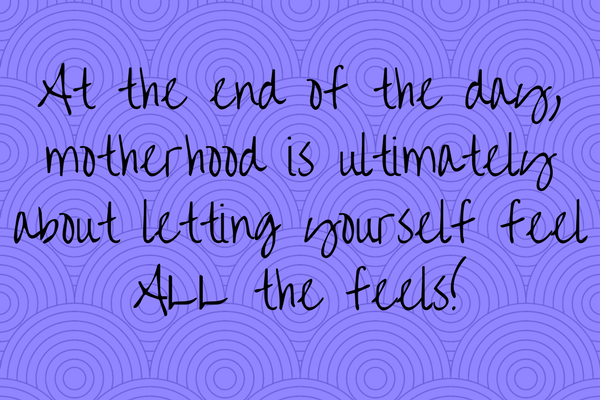 I finally understand and get for myself the irony that is motherhood/parenthood – we raise our children only to let them go eventually (whether we’re ready or not). Kaiden is quite literally my greatest wish come true. I clearly dreamed of him long before he was a reality. But one day, my baby boy will no longer be a baby. He will no longer need or even want us around all the time. He’s rightfully going to grow into an independent person with his own wishes, dreams, desires. He’s going to venture out into the big, bad, beautiful world and make his own impact. And when he does, nothing will make me happier as his mama. But if I’m being 100% honest, a very selfish part of me will also be sad and scared. I mean, a small part of me is already sad and K isn’t even six months old yet! Can you imagine how I’ll be in 18 years?! HOT MESS EXPRESS! In all seriousness though, I’ve quickly learned a lot about myself, motherhood, etc. in the past few months…with MANY more lessons and experiences on their way of course. I share these particular (and crazy!) thoughts of mine because one of the biggest lessons I’ve learned thus far is to truly and completely let myself feel ALL the feels as and when necessary. Motherhood is all consuming in more ways than one. And the very best way, from what I can tell at least, to make the most of this wonderful, challenging, relentless, blessed, rewarding, hard, tiring, miraculous, crazy, beautiful, messy, fun experience is to LET YOURSELF FEEL ALL THE FEELS! It’s what it’s ultimately all about.